The fifth solo exhibition by Associate Professor Robert Bordo at the Chelsea Gallery Alexander and Bonin has received attention from local and national media. "Three Point Turn," on view until April 27, presents recent paintings that "intrigue and satisfy," according to the New Yorker. The review goes on: "Simple but sneakily potent images emerge, as if by happy accident, from nonchalant-looking slathers in resonant dark hues. … The longer you look, the better the work gets, and it may keep growing on you later, in piqued memory." Roberta Smith, reviewing the exhibition in the April 19 edition of the New York Times, calls the show "outstanding," and concludes, "With meaning suspended between painterly fact and pictorial ambiguity, his expanded repertory points to a very interesting future." Peter Plagens reviewed the exhibition in the March 29 edition of the Wall Street Journal (available by subscription only), calling it "witty" and "downright likable." The New York Observer also covered the show on April 4. In tandem with the exhibition a number of interviews with Professor Bordo have appeared, including one in the Brooklyn Rail. Just prior to the opening, in March, Artforum.com's 500 Words featured Professor Bordo. 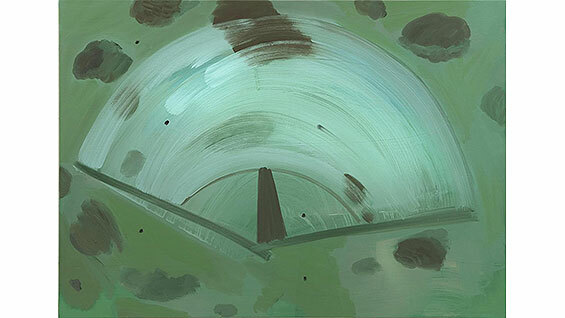 In it, he discusses some of the driving related imagery of the show, including smeared windshields and rear-view mirrors: "I keep coming back to this idea of reenactment, digging around in the material of painting to unearth an existential landscape made of dirt, hills, and roads, perhaps even a rear-view mirror, so space and time can go forward and backward, creating a kind of twilight-zone hysteria and an escape narrative."